SAS Press is now 25 years old! To commemorate this milestone, I decided to research a question that has fascinated me for years: Who was the first person outside of SAS Institute to write a book about SAS? I first heard about this controversy at the Western Users of SAS Software conference back in 1994. That year I attended my first BBU (Books by User, now SAS Press) Authors Dinner where David Baggett, the first BBU Acquisitions Editor, mentioned the competing claims to the title of First BBU Author. Who was first depends on how one defines a book by user. The first book officially published through the BBU program was Thomas Miron's SAS® Software Solutions: Basic Data Processing, published in 1993. Before the official BBU program was created, SAS Institute recruited a handful of outside authors to write books. These notable luminaries include Ramon Littell, Rudolf Freund, David Dickey, H. W. "Barry" Merrill, and Michael Friendly. The earliest such book that I could find is SAS® System for Regression by Rudolf Freund and Staff, 1986. Around the same time, a number of books were being written and published entirely outside of SAS Institute. Among these popular grassroots authors are Jay Jaffe (Mastering the SAS® System, 1989), Frank DiIorio (SAS® Applications Programming: A Gentle Introduction, 1991), and Rick Aster and Rhena Seidman (Professional SAS® Programming Secrets, 1991). 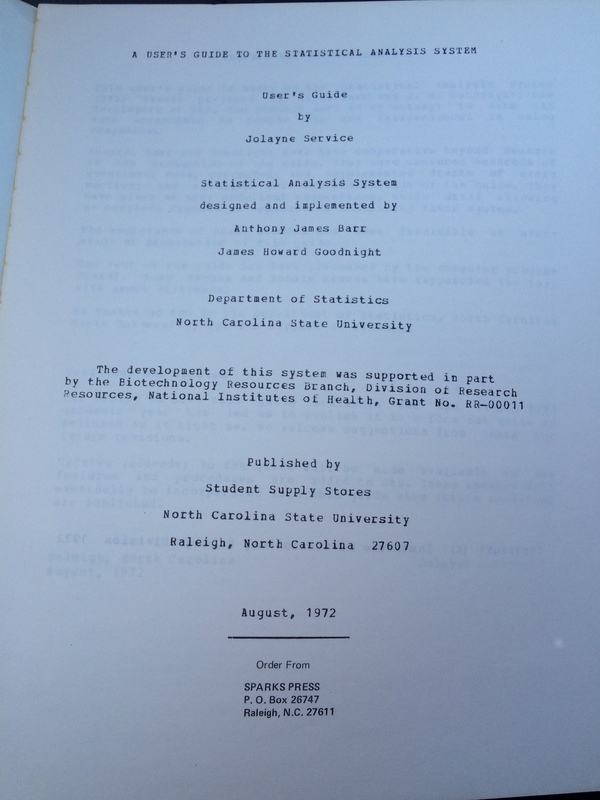 However, Ronald Cody and Jeffrey Smith beat all these authors by an impressive margin with the book Applied Statistics and the SAS® Programming Language, published in 1985 by Elsevier Press (now Prentice Hall) and still in print! Most of the authorities I consulted named the Cody and Smith book as the first, but it turns out that there was an earlier book—much earlier, in fact. 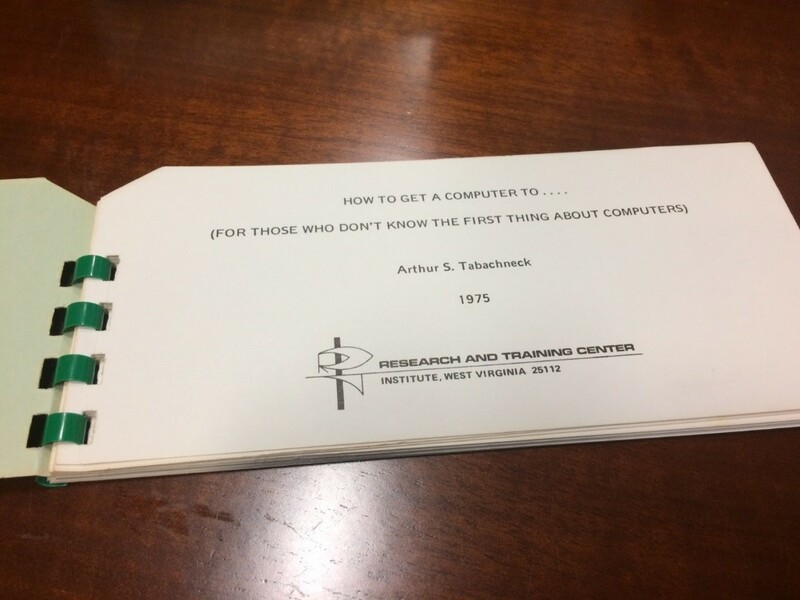 Arthur Tabachneck wrote How to Get a Computer to.... (For Those Who Don't Know the First Thing about Computers) way back in 1975. It is not obvious from the title that this book really is about SAS, but page 2 leaves no doubt. Some people may question whether this document qualifies as a book. You can judge for yourself by viewing it here. However, one interesting piece of evidence is that Amazon.com lists it as a book. So what do you think? Who was the first person outside of SAS Institute to write a book about SAS? Feel free to post a comment sharing your memories of early books about SAS. 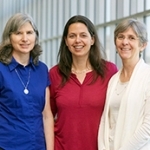 Susan Slaughter (left) is best known as one of the authors of The Little SAS Book. Her newest book, written with Rebecca Ottesen and Lora Delwiche, is Exercises and Projects for The Little SAS Book Fifth Edition. Susan discovered SAS software in graduate school over 30 years ago. Since then she has used SAS in a variety of business and academic settings. She has presented over 90 papers at local, regional, and international SAS user group conferences, and currently works as a consultant through her company, Avocet Solutions. Arthur - PLEASE write a short book that simplifies for Macros work! Amin: Write me (art@analystfinder.com) regarding what you have in mind and, who knows, it might actually happen. I like the phone conversation on the second page of Art's book. It sounds like a computer code. 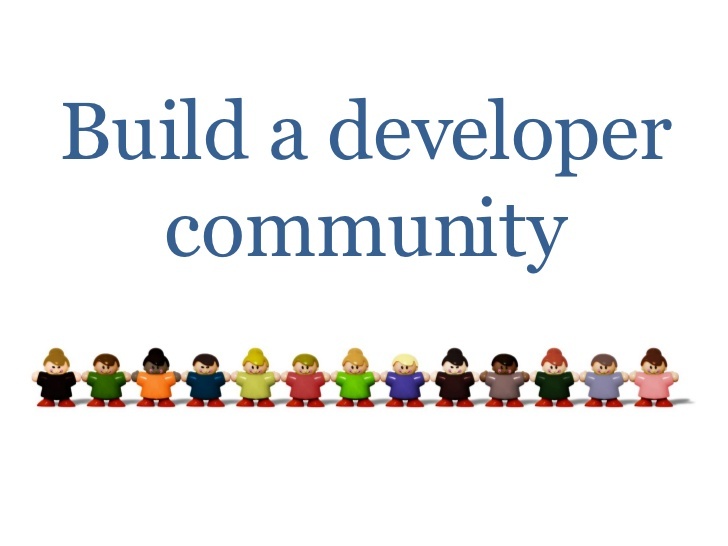 Today if you author a SAS book, you're one of a crowd, a fairly large crowd actually. Just amazing to watch that evolution. Yes, it is amazing. On support.sas.com there is a link for listing all the SAS Press authors. I just did a quick count and came up with 236! Thanks so much. Although i've not read your book, but i always appreciate my "The Little SAS Book"
A fun post, Susan! I love the punch card format of Art's book. @Michele: FWIW, In those days it was a status symbol to be seen walking around with a deck of IBM cards in one's shirt pocket. My boss at the time (Dr. Joseph Moriarty) thought that would encourage a number of folks to take a copy of the book so that they would be seen walking around with a deck of cards. @Susan: Got you beat! My first modem was only 110 baud. And, for anyone not familiar with such equipment, we DIDN'T forget to include the K! @Art, I'm trying to picture what 110 baud must have been like. I bet that was one of those modems where you took the receiver from a phone and placed it physically on the modem. Looking back, it's amazing that we were able to get anything done back then, isn't it? At least they were better than teletypes!! On the other hand, I remember thinking to myself "These are the good old days." And they were too. @Susan: Yup! Call computer center, put phone on cradle, wait for the connection noises to stop, then start typing. Quick typing skills were definitely NOT needed. However, it as a lot quicker than walking across campus, with a deck of cards, to the computer center. 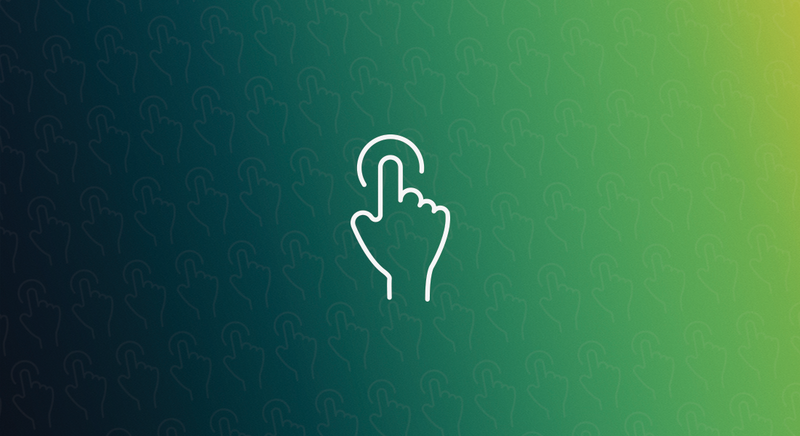 Plus, we could call up and edit programs, correct any errors, and resubmit. Definitely seemed unbelievably great at the time. @Susan: BTW FWIW, the book's paper wasn't just cut to look like IBM cards, the stock used was also approximately the same weight and texture as IBM cards, thus really did look and feel like a bound deck of cards. Do you know if there is a promo code that works on the UK Amazon site please? Because I am redirected to Amazon or to Blackwells, when I click on the "Learn How to Buy" link. I have no strong feelings on the matter, but the author himself describes this as a pamphlet. It's right there in the pamphlet on page 2 (page 5 of the pdf). @Meta: Poor choice of words as it did have covers and was bound. Regardless, I'd be surprised if it actually was the first written by user bound SAS-related publication. Quite a few of us were already using the software in 1974. Regardless, it was fun to be mentioned amongst those obviously more well known (and rightly so) authors. @Meta: You are right and I love the fact that there is room for debate about who was the first SAS user to write a SAS book. I'm just sorry that I can't lay claim to the title myself. With a book published in 1995, I'm a definite late comer to the party. @Susan and @Meta: I'm definitely not going to argue what is or isn't a book. At the time I wrote "How to get .. ..", I understood that it was simply going to be a pamphlet (i.e., not bound). The final choice of size and format was made, by others, after I'd left to pursue my Ph.D. at Michigan State. Thus, unless someone comes up with something done earlier, I'll accept the prize for having been the author of the first "bound publication about SAS written by a non-SAS employee." BTW: what was the prize again? Art, I believe the prize is undying glory. And I think having your publication listed as a "book" on Amazon and in WorldCat.org gives you a strong claim to the title of "first book written by someone outside of SAS Institute" (we won't quibble about the fact that SAS Institute didn't exist until 1976), but if you want to say "first bound publication," that's fine. Who am I to argue with such a well respected author as you? Done! I took my very first selfie with Barry Merrill at SASGF15 in Dallas. I worked with MXG in the 80's and was like a small kid when meeting him in person! Priceless! Made me feel a bit old, but loved the article. Out of curiosity, after reading Deryl's comment, I tried to find out who Sally might be. I haven't succeeded, as yet, but came across an interesting summary of Barry Merrill's career. Did you know that State Farm was the first SAS customer and that they purchased their copy of SAS for $100? I learned SAS, in 1974, when I was working as a statistician for Vocational Rehabilitation in order to help pay my way through graduate school. The GI bill, unfortunately, wasn't quite designed to see one through their Ph.D., but definitely provided a good start. Maybe this will make you feel younger: Brandy Philip-Ellis at SAS also sent me scans of some old in-house documentation from SAS. I didn't include these in my post because I was writing about things that were written by people from outside the institute, but some of the in-house documentation is much older than your book. And here is the cover from a manual dated 1971. I love this since I used to compute at TUCC via a dial-up modem at 300baud!! I never met Barry Merrill so it is interesting reading about him, especially the factoid about State Farm buying SAS for $100. Let us know if you find Sally. I wrote Barry and he got back to me almost immediately. Unfortunately, he doesn't remember who that particular "Sally" may have been. However, he did point out that the mentioned book actually wasn't his first SAS-related book. 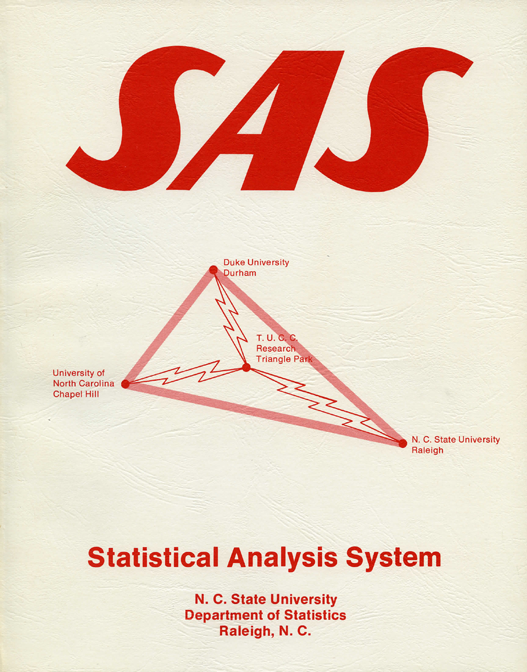 SAS published "Merrill’s Guide to Computer Performance Evaluation" in 1979. I just watched the video and discovered something that conflicts with what I had previously known(? 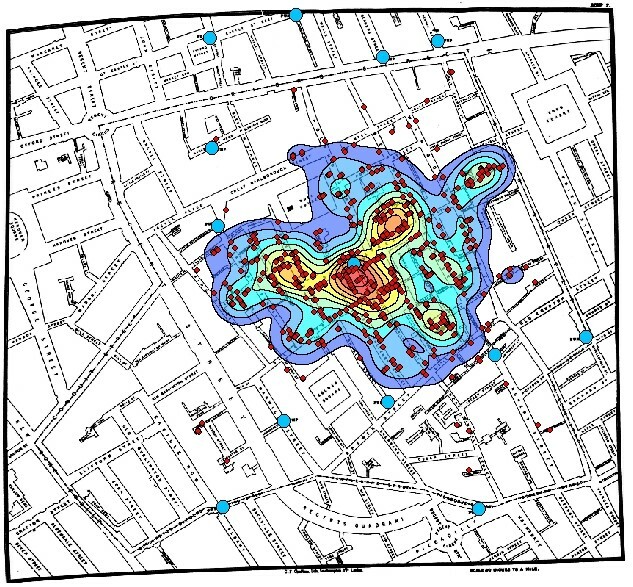 ), namely that the first SAS user group meeting was actually held in 1974. Thanks for the correction about the earliest version of Barry Merrill's book. 1979 is a lot earlier than 1986! The early books in that category (written by people outside of SAS but published by SAS) were particularly hard to track down. I found the 1986 one listed on Amazon, but had a suspicion that there might be earlier ones which is why I said that the earliest one "I could find" was in 1986. Thanks for the link to Tony Barr's talk. I learned a lot and he even shows photos of the earliest SAS documentation including Merrill's book. Here is a "small world" detail: Back in 1985 I lived across the street from Jane Helwig in Gainsville, FL. At a neighborhood potluck, she introduced me to Tony Barr. They told me that they used to work for SAS Institute and acted like it was no big deal. Years later I found out that they were two of the four founders of SAS Institute! I always wondered what happened to them and now I know: They both did very well. I believe Sally Carson may be the subject of the inscription. I only go back to 1978 as a SAS user and eventually got involved in regional (NESUG) conference organization. I was part of David Baggett's effort to form a coalition of RUGs and had the pleasure of meeting Sally thru that effort. She was the SUGI chair in 1984 when Barry's book was published; I also seem to remember that she did some CPE work. Thanks for sharing. That was definitely an early one, and I love the inscription! 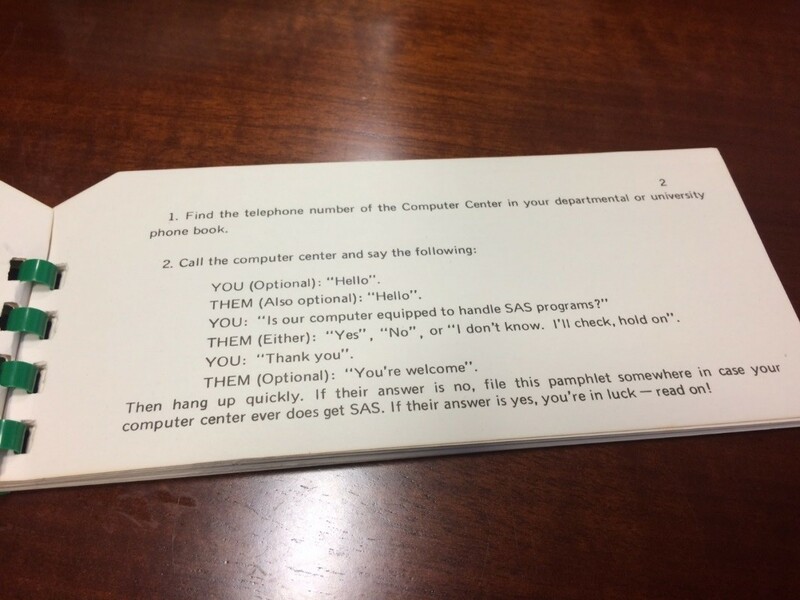 I have a copy of Barry Merrill's book: Merrill's Expanded Guide to Computer Performance Evaluation Using the SAS System, 1984. It's a signed copy (but not to me): "To Sally, May this help you with your own performance! Merrilly Yours, Barry"